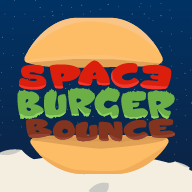 Space Burger Bounce is a game that Sunhyo Mastenbroek and I (Max Kruf) have made for a school assignment. We had 2 lessons for this (8 ours total) and some time at home. You can collect hamburgers to fart more and reach the end of the level. The coding was done by me and the concept and art is made by us. It is made for Android, but you can play the converted WebGL version here.